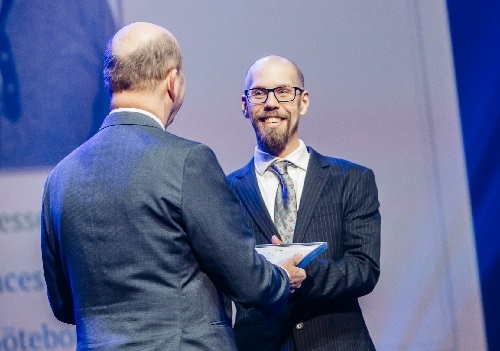 On February 12, the 5th SCOR Young European Researcher Prize for Research into Alzheimer’s disease was presented to Erik Portelius of Sweden’s Gothenburg University, for his findings on a new biomarker that enables earlier detection of the condition. This new biomarker, a protein called neurogranin, paves the way for a better understanding of the disease. It allows doctors to estimate the extent of the damage to patients’ synapses and also to predict the rate of cognitive decline in patients with mild cognitive impairment. By measuring the new biomarker, the disease can be detected at an earlier stage than previously, since the loss of synapses is believed to occur early in the disease process, perhaps even earlier than neuronal loss. Until now, the degree of neuronal loss has been a difficult thing to identify in Alzheimer’s sufferers. The measurement of neurogranin, which will soon be implemented as part of a routine clinical analysis at the Clinical Neurochemistry Laboratory in Gothenburg, Sweden, involves extracting cerebrospinal fluid during a harmless lumbar puncture or spinal tap, which is then tested for the neurogranin protein. Alzheimer’s disease is a neurodegenerative disease caused by the accumulation of proteins in the brain, permanently damaging the memory and leading to the death of the patient. There is currently no available cure. Treatments available today target the symptoms of the disease, helping patients to cope with memory loss. These treatments do not stop the progression of the disease. Nevertheless, there is reasonable hope that we will see a cure within the next 5 to 10 years. Early diagnosis of the disease will then become even more crucial in order to obtain the most effective results.